“In the world of theater, the ability to make up your own projects rather than rely on outside sources is critical." Lecturer, "Comedy and Laughter," Eastern Kentucky University, Richmond, KY, January 2019. ​Teaching Artist, "Playwriting/The War on Two Fronts," Eastern Kentucky University, Richmond, KY, February and March, 2018. Teaching Artist, 4 classes in Directing, Dramaturgy and Playwriting, Otterbein University, Westerville, OH, February 20-22, 2018. Teaching Artist, "Breaking from Realism," Ohio University, Athens, OH, October 2017 and January 2018. ​ Eastern Kentucky University, Richmond, KY February 2017. Lecturer, "Playwriting for the 21st Century," Washington University, St. Louis, MO, February 2016. Workshop Instructor/Master Class, "Breaking from Realism," MFA Playwriting Program, Spalding College, Louisville, KY, November 2015. Workshop Instructor, "Monsters on Stage Monologues and One-Act Plays," CityWrights Festival, City Theatre, Miami, FL, June 2015. Workshop Instructor, "Breaking from Realism," Humana Festival of New American Plays, Actors Theatre of Louisville, KY, March 28, 2015. Visiting Instructor, "Playwriting," Eastern Kentucky University, Richmond, KY, March 8, 2015. Mentor, Inkwell Theatre "Wellspring Project," Washington, DC December 2014 - February 2015. Workshop Instructor, "Breaking from Realism," Hub Theatre, Fairfax, VA, February 7, 2015. Panelist/Author, "Breaking from Realism: A Map/Quest for the Next Generation," Drama Book Shop, NYC, October 2014. Workshop Instructor, "Breaking from Realism," Kennedy Center, Washington, DC, August 30, 2014. Workshop Instructor, “Solo Performance,” Actors Theatre of Louisville Apprentice Company, August 2014. Cincinnati, OH, July 24-27, 2014. Workshop Instructor, “Playwriting for the 21st Century,” Educational Theatre Association Conference, Cincinnati, OH, July 24-27, 2014. Workshop Instructor, “Breaking from Realism,” CityWrights National Play Festival, Miami, FL, June 28-29, 2014. Workshop Instructor, “Breaking from Realism: Playwriting for the 21st Century,” SETC Convention, Mobile, AL, March 2014. Visiting Teacher, “Playwriting and New Plays,” Eastern Kentucky University, February 20, 2014. Keynote Speaker, "Those Who Can, Teach," Dramatists Guild Conference, The Ohio State University, October 2012. 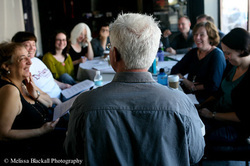 Teacher, Master Class in Playwriting, College Days/Humana Festival of New American Plays, Actors Theatre of Louisville, March 2011. Workshop Instructor, Master Class in Playwriting: Breaking with Realism, Inkwell Theatre, Washington, DC, 2011. Guest Teacher, Kennedy Center, American College Theatre Festival, Washington, DC, 2011. Teacher, Master Class, The Inkwell Theatre, Washington, DC, Master Class in Dramaturgy, Oct. 2009. Guest Instructor, “Self-written, self-performed monologues," University of Washington, Seattle, 2006. Coordinator, director and teacher: Guthrie Summer Conference – Creating New Work for the Theater, Minneapolis, MN, July 2002. Guest Lecturer on Playwriting, Augsburg College, Minneapolis, MN, 2002. Guest Lecturer on Playwriting, University of Minnesota, Minneapolis, MN, 2002. Guest Lecturer on Contemporary Theatre, Carleton College, Northfield, MN, 2002. Respondent, American College Theatre Festival, Washington, DC, 2000. Guest Lecturer, Theatre Department, Virginia Commonwealth University, Richmond, VA, 1999. Guest Lecturer in Dramaturgy, Ohio University School of Theater, 1996. Instructor, Ten-Minute Play Workshops, Action Theatre in Singapore, 1993. Instructor, KY Playwright Development Workshops, Actors Theatre, 1986-97. Instructor, Alley Theatre Companion Course, Rice University, 1985. Dramaturg, Student Playwriting Project, Pomona College, 1984. Instructor, Playwriting, University of California–Riverside, 1980. Guest Playwright, Playwriting Workshop, Coker College, SC, 1979. Program Director, Creative Dramatics for Physically and Mentally Challenged Children, Bancroft Camp for Exceptional Children, ME, 1976. Teaching Intern, Acting/Drama, Northfield-Mt. Herman School, MA, 1974.